Are Concert Fans and Music Venues Using Foursquare? For the last few months I’ve been doing a test with Foursquare. And I’ll admit, like other new mobile social apps, I wasn’t completely sold on it. 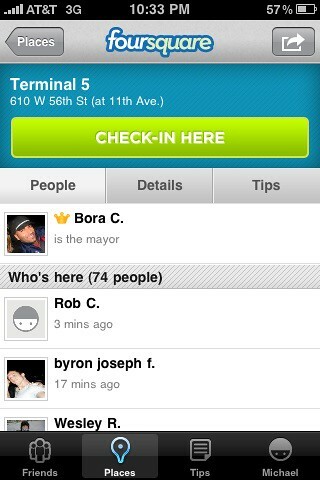 I had to play around with Foursquare for awhile to find out how it works and how it can be useful in my life. Well, I think I’ve figured it out. And now all this testing raises important Foursquare questions for concert fans and music venues. Update: More info on how The Roxy in LA is using Foursquare, how to add your venue and links to recent developer evolutions have been added below. Update: This summer VH1 is running a Foursquare-based contest for concert fans who check-in at select Live Nation venues. Have you used it? If you’re new to Foursquare I’ll do my best to quickly sum it up by saying that it’s a location-based mobile social media app that’s similar to user-generated restaurant rating service Yelp. But what’s different is that Foursquare makes things a bit more fun and game-like and even competitive at times. When you use Foursquare you can “check-in” to everything from concert venues and restaurants to workout gyms and grocery stores, or even large group events. And when you “check-in” you get points and sometimes a special badge as you visit more venues or leave more tips for your friends to find. For me, one of the reasons I’ve enjoyed Foursquare is because it’s fun to give “shout-outs” to cool places that others might want to visit when they’re in the area. And I’ve been to a few places already just because I’ve seen some of my friends enjoy the venues, too. How Should Concert Fans and Music Venues Use Foursquare? Well, aside from the obvious sharing of all the cool places to see live show, Foursquare’s ability to gather up points and “become a Mayor” of venues is where I think concert fans and music venues have the most chance to benefit from using the app. I say this because, as Foursquare continues to become more popular, venues have begun to offer special discounts to “Mayors” making “Check-ins” a sort of fun competition and more importantly giving users as a reward for coming to the venue more often. For example, just this week I became “Mayor” of Tommy’s, a local hot dog joint that I go to way too often. And when I was told by the Foursquare auto-message that I had just ousted the former Mayor of Tommy’s from his Mayorship, I strangely felt like I was a test subject in some reward-based Pavlovian social media experiment because I had felt this buzz of pleasure knowing that I was now the Mayor. And besides local hot dog joints, I also go to a lot of local concert venues, too. But becoming Mayor of my favorite Chicago concert venues is a lot tougher since there’s other concert fans checking in regularly, too. Nonetheless, I’ve still had fun leaving behind little tips and raves about the concert venues that might be helpful to others as they discover places like Metro, The Empty Bottle, Bottom Lounge or Reggie’s in Chicago. But Do Concert Fans Use Foursquare? Foursquare debuted last year at SXSW and ever since it has continued to grow in popularity as mobile apps become more a part of our daily lives. That said, I’d like to ask those of you who’ve been using Foursquare to check into concert venues what your experience has been like. Have your favorite concert venues started offering “special” badges or deals for the local Mayor? What are the best Chicago concert venues to “check-in” at? How have you been using Foursquare to enhance your concertgoing experiences? What About Concert Venue Owners? If you’re a concert venue owner, I’d like to hear your thoughts, too. Are you even using Foursquare? How do plan to integrate Foursquare in to your venue’s larger social media plan? Have any concert fans asked you about “Mayor” specials or unique badges for multiple check-ins? What have you told them? There’s a bigger discussion going on about Foursquare and for the sake of getting to the point in this post, I’ve just looked at the broader points of Foursquare. So I encourage you to check out this Social Media Examiner blog post for more info and a deeper dive.